NASA cleared the space shuttle Atlantis to launch toward theInternational Space Station Monday on a delivery mission. Atlantis is set to lift off at 2:28 p.m. EST (1928 GMT) onNov. 16 at from Launch Pad 39A at Kennedy Space Center in Cape Canaveral, Fla.to carry sixastronauts and two cases of large spare parts to the station. The weather outlook is optimistic for Monday, with a 90percent chance of clear skies predicted. "Overall Monday is looking good so hopefully we'llgo off on Monday," weather officer Kathy Winters said during aSaturday briefing. An Atlas V unmanned rocket slated to launch from the nearbyCape Canaveral Air Force Station early Saturday stooddown at the last minute for crews to investigate a power glitch. Thecancellation frees up the schedule for Atlantis to proceed as planned, andAtlas managers will aim to try again to launch after Atlantis lifts off. 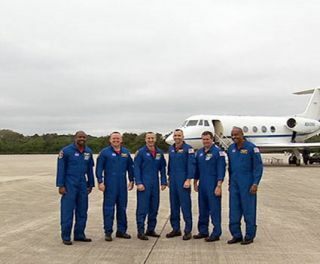 "They'll be ready to go when they're ready," saidMike Moses, chair of Atlantis' mission management team. "We fully expectwe'll be out of here come Monday and the range will be clear for them to tryagain." The mission management team met this morning to discuss thestatus of the mission, and there was "a unanimous vote to proceed with thelaunch countdown," Moses said. The shuttle's countdown toward liftoff began on Friday at 1p.m. EST (1800 GMT). So far, everything's gone smoothly. "We're one day into Atlantis' countdown and I'm happyto report we're right on the money," said launch director Mike Leinbach. One issue NASA is monitoring is a brokenurine recycling system on the space station, which helps to process wastewater and turn it back into usable drinking water. A mechanism in the machine failed,and managers decided to ship the broken instrument back on Atlantis to beanalyzed on the ground. Meanwhile, the station is left with a limited ability torecycle water, although the station residents should be able to manage by usingthe other facilities onboard. Ultimately, the malfunction shouldn't present aproblem for the incoming shuttle crew. "There's no impact," Moses said. "Bottomline, they're in pretty good shape." Commander Charlie Hobaugh plans to lead the six-memberSTS-129 crew on the 11-day space trip. The mission will feature threespacewalks to attach the cases of spare parts to the station.